Personalized Address Plaque with Flowers - - 10.75" x 6.875" rectangle address sign features a detailed flower theme panel above the address. Made in USA. 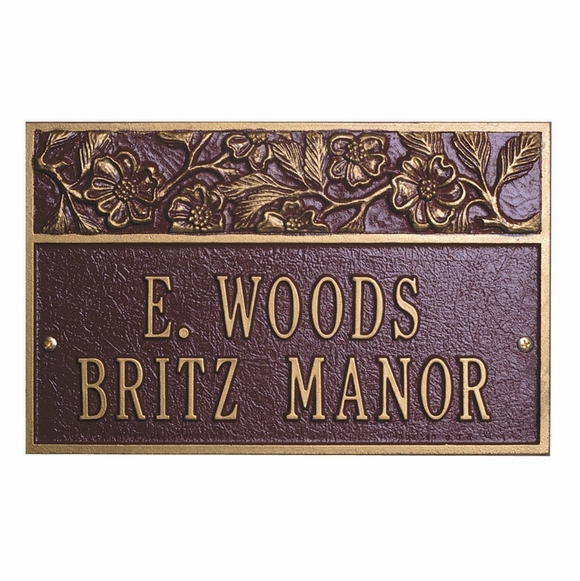 Wall mount address plaque is made to order in the color you select and one or two lines of personalization. Shown above in color OG bronze/gold. Decorative upper panel contains a design of delicate flowers, detailed leaves, and curving branches. Rectangle address sign with floral panel on top is wider than it is tall and suitable for a narrow space.